I believe that sports instills a belief in a person, it makes them confident, irrespective of whether they are playing it or watching it. People don’t play sports just because it is fun. Ask any athlete, most of them hate the physical sacrifice behind it. But they can’t imagine their life without it. It is a part of them: the love-hate relationship. It is what they live for – the practices, parties, cheers, long bus rides, invitationals, countless pairs of shoes, water, Gatorade, and coaches they might hate but appreciate. They live for the way it feels when they beat the other team, and knowing those two extra sprints they ran in practice were worth it. December 2012 might not be the end of the world as it was earlier predicted but it did start with the end of the hopes and dreams of the thousands of Indian athletes, who had dreamed of being a part of the greatest, the oldest and the most celebrated event in sports – Olympics – with the suspension of the Indian Olympic Association by the International Olympic Committee. More shame was to follow with the International Boxing Association suspending the Indian Amateur Boxing Federation saying in a statement that it had learned of “possible manipulation” in a recent election held by the Indian group, following which India’s Ministry of Sports also “de-recognized” the Archery Association of India. This came as a major embarrassment for the second most populous country in the world. Until now the question that popped up in peoples’ mind was why does a nation with a population of 1.2 billion ends up with a few bronze and silver medals every four years? Now new questions have surfaced and everyone knows the root cause of this predicament. “The International Olympic Committee on Tuesday suspended the Indian Olympic Association for chronic violations of the international Olympic Charter, creating one of the most embarrassing episodes in Indian sports history,” Gardiner Harris wrote in The New York Times. We as Indians always choose to ignore and turn our backs to the one virus that has been eating away our country in slow sordid manner. Our nation has always managed to surface above all the controversies and questions just because its own citizens did not bother raising them. The shameful decision that was taken by the International Olympic Committee cannot be ignored. Not now, when we know that the only reason is the corruption and the disorganized political structure of our country that will eventually be the end of this country as a whole. And for what? For whom? Abhay Singh Chautala, a politician from the Indian National Lok Dal Party, is the man at the center of the controversy. During elections held on Sept. 23, 2011, Abhishek Motaria, a politician from Rajasthan, replaced Mr. Chautala as president of the Indian Amateur Boxing Federation. According to a statement made by the Indian Amateur Boxing Federation, on the same day, Mr. Chautala was named chairman of the federation – a post that was created just before the election, through an amendment to the body’s constitution. It is quite evident that all we are trying to do is please people. We always have been a people pleasing country. Try relating to the spirits of those thousands of sportsmen and the way they would be affected by this decision: years of training and hard work will go down the drain. The endless dreams and the ordeal they went through physically and mentally will be for nothing. All this because of the few men who put their ego ahead of their country, not to forget the responsibilities that they swore to take care of. This event was like a silent nuclear holocaust, the effects of which we will witness in time to come. If no step is taken to put a stop to what is happening, then it can be predicted that this incident will be a start of series of similar happening which will eventually paralyze the whole nation and we would just sit and watch it getting torn apart from inside. All this while the thousands of sportsmen and sports women across the country put their body and soul through punishment for years in order to find their peace, happiness and eventually their moment of glory. And for the many who have given the best years of their lives for a single skill and be told to give up in their twenties and thirties by corrupt officials and parent bodies. Yet they dream. They live and long for camaraderie with their team, they live for the countless songs they sing in their head while training all those hours. They live for the competition, they live for the friends, the practices, the memories, the pain, it is who they are. 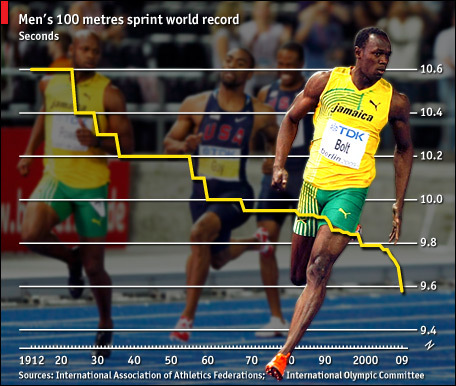 With this being the Olympics year, and with Usain Bolt being its main attraction of the Olympics’ blue-ribbon event – men’s 100m – here is a re-look at the race that stunned the world, when he ran the 100m in an astonishing time of 9.58 seconds. Every batsman around the world must be thanking his heavens that Usain Bolt gave up fast bowling for sprinting. At 6’5” and capable of doing the 100 meter dash swifter than I can in my car, if his bowling speeds was anywhere near his sprinting deeds he’d have been a handful! Cricket’s loss is athletics’ gain. On Sunday in Berlin he decimated his Olympics time of 9.69 seconds by 0.11 seconds to stun the sports world. Sprint records are meant to be broken incrementally like in long jump, pole vault or high jump. Here, within a span of 9 and half seconds, he went a generation ahead of everyone else like Jesse Owens did with his long jump leap at the 1936 Berlin Olympics. If anything, it is befitting that both should have happened at Berlin where Hitler wanted to demonstrate the superiority of Aryan race over ethnic African race. Sample this: since Jim Hines became the first man to go under 10 seconds in the 1968 Mexico City Olympics to set the then world record, it has been broken 12 times since. The world record time has never been bettered by more than 0.05 seconds – when Maurice Green clocked 9.79 seconds in Athens (1999) he broke Donovon Bailey’s 1996 Atlanta gold medal winning performance of 9.84 seconds by 0.05 seconds. Ben Johnson did thrash Calvin Smith’s world record of 9.93 seconds by 0.10 seconds in Rome in 1987 only for his time of 9.83 seconds to be disallowed along with all his other achievements between 1981 and 1988 after testing positive right after winning the Seoul Olympics gold with another world record time of 9.79 seconds. That it took another 12 years for anyone to get to that mark of 9.79 seconds shows how difficult it is to nick a good 1/10th of a second off the world record. Bolt has now smashed his last world record of 9.69 seconds from Beijing Olympics by 0.11 seconds. It has never happened before that a sprint record is bettered by so much, at least since electronic timing came into the sport in 1977. He is the only person to have breached the 9.7 and 9.6 seconds’ barrier. Now he says he can go under 9.5 seconds! The next fastest time ever is 9.71 seconds – Tyson Gay (0.13 seconds behind). Asafa Powell’s best is 9.72 seconds. The 12 fastest men after Bolt are separated by a mere 0.15 seconds between them. It simply shows how much he is dominating his sport and how far ahead he is from anyone else. It is not like Sergei Bubka and Yelena Isinbayeva bettering their pole vault world records by a centimeter or two each time, it is like bettering it by 15 centimeters at one go (Bubka took more than 10 years to better his world record by 20 cms and Isinbayeva has taken 4 years to increase her record to 5.05m after breaking the 5m barrier in London in July, 2005)! Bolt is sprinting his way to becoming the greatest athlete of them all. 9.58 seconds! I still can’t believe it! This article appeared on Bleacher Report on August 19, 2009.